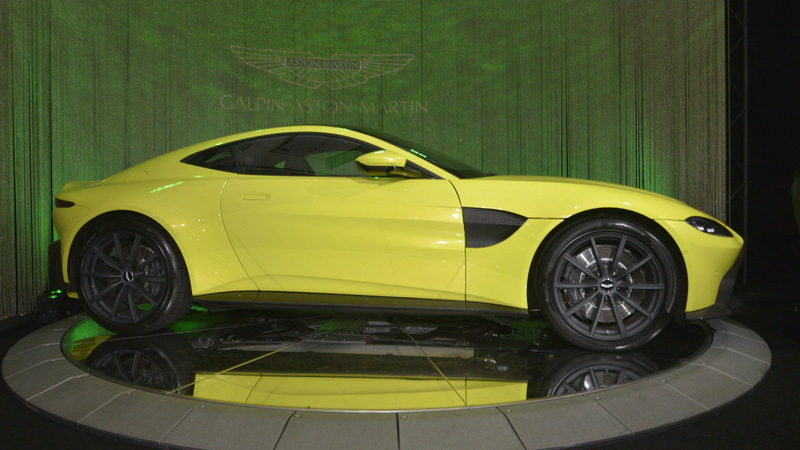 The current Vantage is the most popular model in Aston Martin’s history, so clearly there was some added pressure to get the design of the successor right. 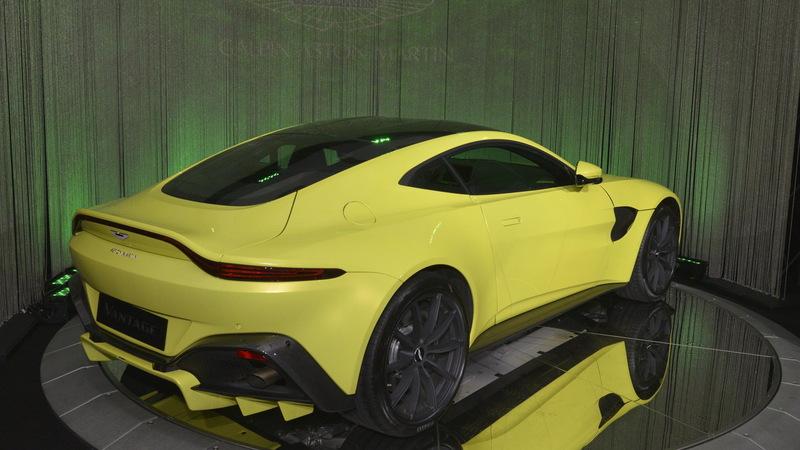 Fortunately Aston Martin appears to have pulled it off as the redesigned Vantage, which made its public debut this week at the 2017 Los Angeles Auto Show, is shaping up to be an absolutely brilliant sports car. Starting at the front, the aggressive face with its low, gaping-mouthed grille hint at the brute performance on offer, while the pure, sculptural forms of the flanks create an athletic, predatory stance that expresses the agility inherent within the car. And finally, as you move toward the rear, the technical look of the taillamps indicates that this is a thoroughly modern car packed with the latest technology. Elements like the front fender vents and huge rear diffuser aren’t just for show, as aerodynamic performance played an important role in the design. For example, the aggressive front splitter directs airflow underneath the car where a system of fences channels it to where it’s needed and then out the back via the diffuser. And those fender vents bleed air pressure out from the front wheel arches, while the ducktail rear spoiler boosts downforce. 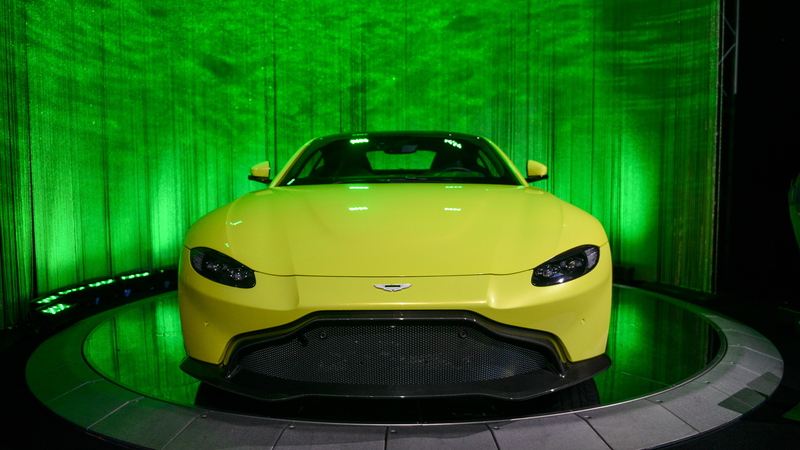 The powertrain is the familiar 4.0-liter twin-turbocharged V-8 developed by Mercedes-AMG, though Aston Martin’s unique tuning ensures the Vantage will have a distinct sound. 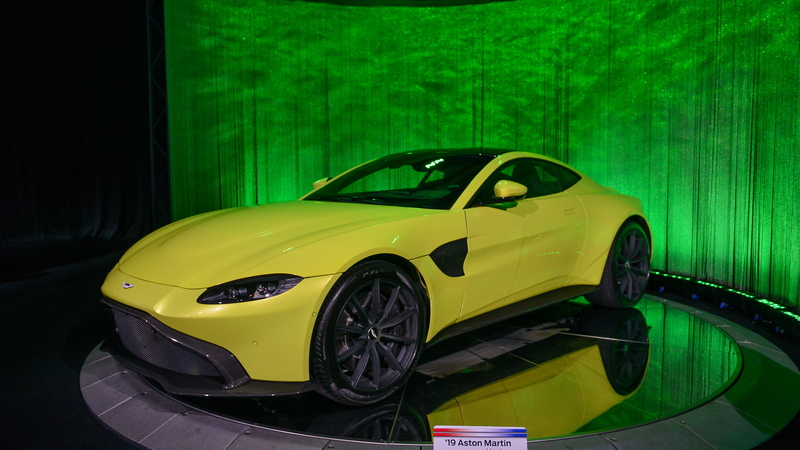 The numbers come in at 503 horsepower and 505 pound-feet of torque, which Aston Martin says will see the Vantage sprint to 60 mph from rest in just 3.6 seconds and top out at 195 mph. Aston Martin also uses the engine in the DB11 V8, where it deliver the same 503 hp but a higher 513 lb-ft of torque. Drive is to the rear wheels only, via an 8-speed automatic. The transmission is mounted at the rear for better weight distribution. At 175.78 inches, the new Vantage is 11.18 inches shorter than the DB11 and 1.33 inches shorter than a Porsche 911. Making the compact proportions possible is a shortened version of the DB11’s bonded and extruded aluminum platform. Despite the sharing of a platform, roughly 70 percent of the Vantage’s structure is said to be unique. Getting weight down was one of the priorities, and while the dry weight of 3,373 pounds is on the heavy side for a small, 2-seater sports car, it’s perfectly balanced with 50:50 front-to-rear distribution so shouldn’t have too much of an impact on the handling. There are also electronic chassis systems to sharpen the handling, too. These include an electronic rear differential with torque vectoring (a first for Aston Martin), adaptive dampers and electronic power steering. The systems are all linked and can be adjusted between Sport, Sport Plus and Track modes. The wheels on the new Vantage are a 20-inch forged set which come from the factory wrapped in Pirelli P Zero tires measuring 255/40 up front and 295/35 at the rear. The tires were developed specifically for the car, we hear. The interior design is similar to what we’re used to in the DB11, but a high belt line in combination with a low seating position creates a more immersive driving experience, almost like you’re strapped into the cockpit of a fighter jet. An 8.0-inch screen atop the dash serves as the main hub for the infotainment system which includes navigation and Wi-Fi. A Sports Plus Pack is available and adds seats with better bolstering, plus a sports steering wheel and carbon fiber trim. 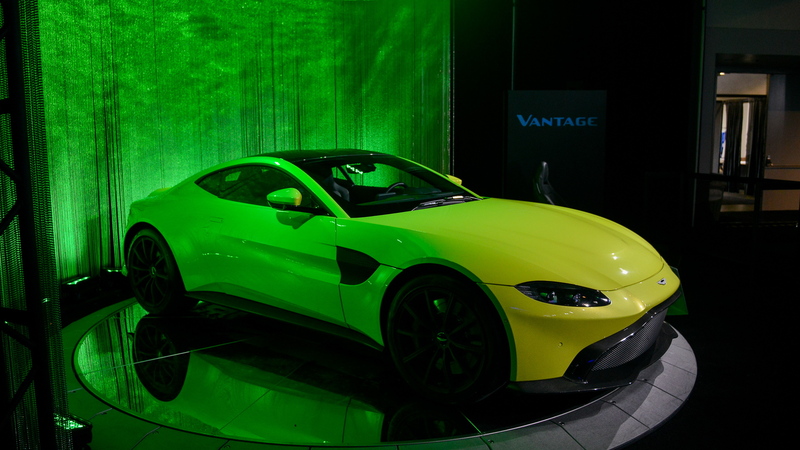 The new Vantage is confirmed to go on sale in the second quarter of 2018 priced from $149,995. To learn about some of the other vehicles on display at the L.A. Auto Show, head to our dedicated hub.